My partner turned to me the other day after scouring his medical blogs and said “why don’t you flip the classroom?” This was new to me but it is not a new concept. The idea being that children watch lectures in their own time, at their own pace. They view the lesson before it has happened. They embrace technology at home and return to the classroom for the homework. This enables a more humanistic approach in the classroom. The teacher becomes free to help the children struggling with the concepts or direct them to their peers who maybe able to teach them more efficiently. The class does their homework in the class time and the children can then collaborate with peers or the teacher to problem solve the questions set. They are no longer left behind in the classroom and sent home to struggle. Salman Khan eloquently states ‘Its like learning to ride a bike and having difficulty braking and turning left. You get a ‘C’ for riding a bike and then the next lesson you are asked to ride a unicycle’. * better attitudes toward learning and school. 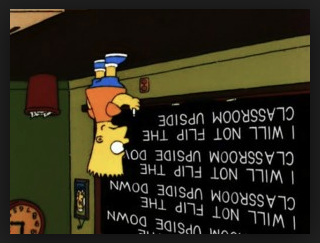 But… as teachers we cannot guarantee what happens at home and therefore the “flipped classroom” may not be success due to, e.g. having access to reliable, consistent internet out of school. Use the “flipped classroom” model in class! If like me, you organise your lessons and the children’s learning by ‘stations’ or different activities, then why not have the direct learning e.g. watching a pre-recorded or selected clip, as one of your stations? This entry was posted in The "Smart" questions facing education and tagged flipped classroom, Saman Khan, teaching theories, technology. Bookmark the permalink.